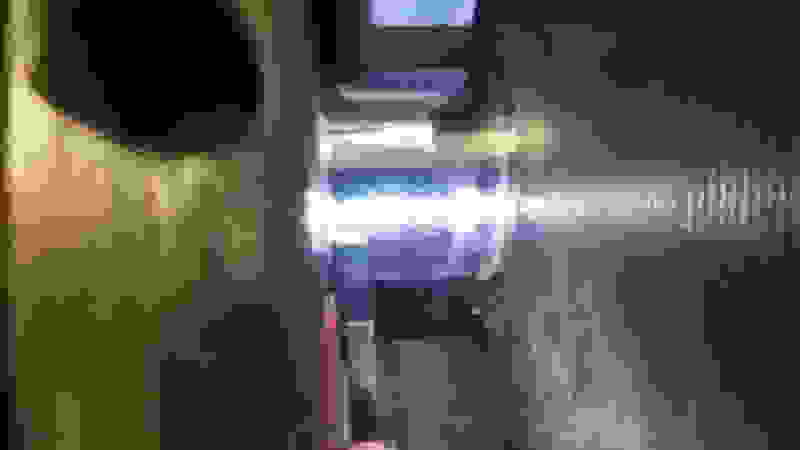 You don’t need oiling mods at your power level, even with a small shot of nitrous. The main problem is the crank. They’re cross drilled and move like spaghetti. Try a new Eagle crank and you’ll see what I mean. But get a new HV oil pump, they now come with a pink spring. Go thru it, file all the surfaces then reassemble it with the new spring. You’ll be good at that point. However if you are going to do more than a small shot or any real amount of boost, then you’ll need to make bottom end mods anyway as well. I’m trying to help you but for some reason there are others on here that are steering you in another direction. That’s fine, go with their advice if you so choose. I understand, no problem. Last edited by cutlassefi; July 1st, 2018 at 05:55 AM. I will go on record saying............do what Travoto or Milan would do, the results speak for themselves. Last edited by VORTECPRO; February 4th, 2019 at 04:34 PM. I should put a production Olds 455 into my stock 10 sec Buick GS 455, would be interesting, of course I'd probably get banned from rubbing in the results of the test. Of course I'd have to get over the idea of having a 4.125 bore under the hood. Might be better to build a 400, production heads would be better suited for this combination. Last edited by VORTECPRO; July 1st, 2018 at 06:36 PM. I'm not steering anyone in any direction just offering up other references. If it was my build I would run the heads as is if they check out as in no issues with parts machining and assembly. New aftermarket rods and a quality balancer you are already doing. just to be on the safe side if using the old pistons. What is the weight of the old pistons? Milan and the machine shop he uses will step drill the block oiling system. Part of it requires going through a #5 main stud hole and installing a time sert afterwards. It works very well, no restrictors required. Thank you all for your opinions and thoughts, and please cut out the arguing and picking on each other. It is unbecoming of what should be a friendly, helpful forum and it's members. I have been mining the real olds power website for info, but I can't find where Milan's step oiling mods are detailed anywhere. If anyone can help, it would be greatly appreciated, as I am trying to learn as many different ways as possible to keep the oiling system alive. 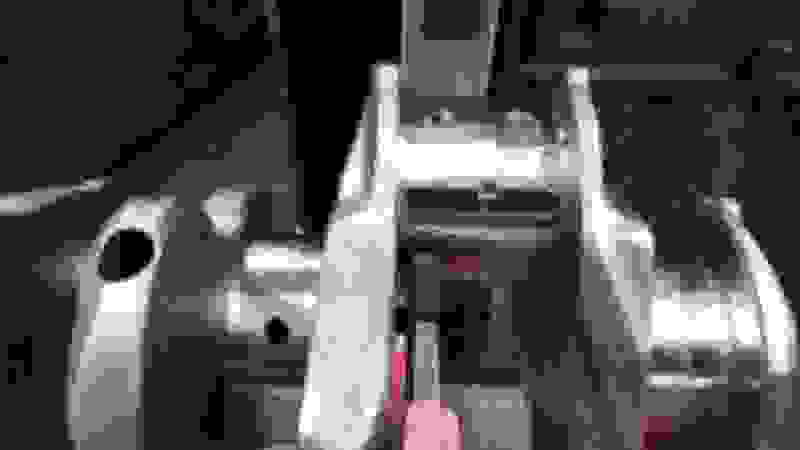 I am calling Melling tomorrow to order a Pink/purple spring for our High volume pump as well. Here is the deal, I used restrictors in 3 other Olds engines before, and I had a 455 that had 25psi of hot oil pressure at idle, which went up to 70psi at 6,000 rpm, where I shifted it. I beat on it hard and drove it for 80,000 miles and never had a problem until it threw the water pump belt (because the water pump locked up) and sent the engine into overheating and embrittled and broke a valve spring, dropping the valve... the rest is history... 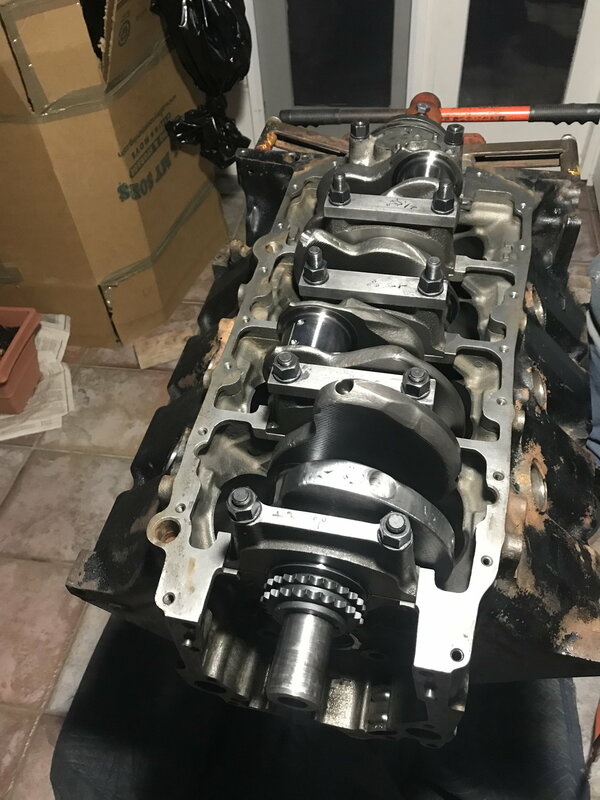 It had TRW forged pistons (that didn't sieze up, in fact, they looked perfect), N crank, .0025 rods and .003 main bearing clearances with the restrictors in the block. Only had a 650 double pumper on it with a Torker intake, and I ran 12.7's with it in a 4200 lb car (without me in it)..... I used to get 14-15mpg in that car with a 400 trans, a Breakaway converter, and 3.42 gears. Just saying this isn't my first rodeo, but, it will be my first time to hopefully have a very healthy bull to ride!!! I am definitely open to changing what I have done in the past for oil control and bearing clearances, as more horsepower and strain will require changes to what I have done in the past. The rev limiter will be set at 6200 for this new build. Isn't it generally accepted that if I can internally balance the crank, it will keep it from flexing nearly as much? I am sending the driver's side header back to American Racing Headers tomorrow, as they are trying to make this header fit the custom Batten flange in the tight early A-body chassis for us..... either way, it looks like we are going to have to relocate the steering shaft to get it up and away from the #7 cylinder. More to come on that later though. American Racing is an awesome group of people and I highly recommend their products, Nick has been very helpful and accommodating to help us out when he really doesn't have to. Last edited by Battenrunner; July 1st, 2018 at 09:21 PM. I don't think the stepped oiling system is a must have as most don't use it. I just posted it so that you can see what others have done. Bill's method is the most straight forward from what I have read so far. You can buy a blueprinted oil pump or blueprint your own as you know. There is a thread on this topic on ROP as a member just went through the process. Last edited by Bernhard; July 2nd, 2018 at 09:17 AM. I will get some pics as things move forward on the build if others are interested, please let me know. I received our Childs and Albert piston ring filer a few weeks ago and went to town on the rings this last Saturday! The original engine blueprint sheet was not accurate, and I am very thankful that we decided to open this engine up for so many different reasons, and the ring gaps were definitely another great reason. I like to set the 2nd rings a little wider than the top ring, to keep the top ring from unloading and making the weaker 2nd ring act as the "compression ring". 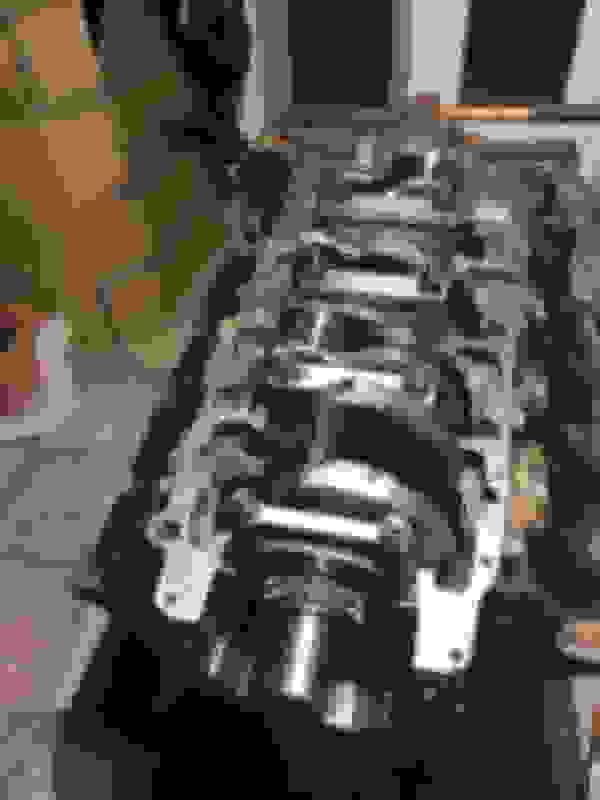 On this engine with a 4.185 bore, I found top ring gaps that ranged from as small as .014 to as large as .020. Every second ring was smaller than each top ring it was matched to, so, you guessed it, the second ring on the piston with the .014 top ring had only .012 gap! Because this engine may one day get some boost or a shot of nitrous, I decided I had to open up the gaps some. Building performance engines in the past has shown me that you can really kill performance with the rings being too tight, but, you usually don't see much negative effect with a looser ring gap (it doesn't even cause much blow-by like many would have you believe). We filed each ring correctly, deburred each time it was test-fitted for gap, then final stoned and deburred all over before being called complete. I fit the rings back onto each piston for now, before balancing. I may check each piston for weight variance and see if they have to be machined for weight matching at all or not when they get balanced with the rotating assembly. Next, to remove the terrible staining on the cylinder walls that the sticky gasket shellac had caused, we worked and worked on wiping the cylinders with brake parts cleaner to remove everything but the color staining and super thin layer on the cylinders. This left the cylinder walls with a weird "glaze" texture where you could feel the difference between stain and clean iron. I had purchased a 4.25 flex hone in 320 grit, so with the cylinders wet with marvel mystery oil, and the flex hone chucked into our 3/8 corded drill, I went at it with a motion and rotational speed up and down that matched the original cross-hatch. The 320 grit made a great finish on the bores, and wasn't too rough but quickly cleaned the stains and discoloration of the ugly cylinders and will allow the plasma moly rings to seat well and quickly. The marvel mystery oil left the ball stones clean and floated the grit and grime away, and the cylinders came out great! I know it is not honing oil, but for a quick flex hone job, it worked great. On another note, we received some awesome new parts for the engine recently that I am very excited about. We bought a brand new ATI External Damper, brand new BTR timing chain set (cast), and the BTR billet pointer, all from a great member on here (75 W-30). 8. Have block double jet-washed and have new durabond cam bearings installed. Last edited by Battenrunner; July 23rd, 2018 at 06:44 PM. 2. Connecting passage to the pass. oil galley 9/16 , which will include a Time -Cert to replace the rear main bearing threads. 6. That will make a fully stepped oiling system and eliminate surging and turbulence. Thanks for the step oiling mods.... very interesting.... might have to consider this. Currently waiting on the new cam to arrive and crank which is being turned, hopefully done by Friday. I would be curious to know if the crank gets done by Friday, also let us know on the sizing. We didn't get the crank back yet, so hopefully we will see it soon next week. Have you got your crank back from Mile High Crankshaft? I have been out of town all week, just got home tonight... I called Dave at Mile High Crankshaft this afternoon, on the way home, and he said it would be ready to pick up tomorrow mid-morning, as he only had to polish it, and it has already been ground. Last edited by Battenrunner; August 9th, 2018 at 08:24 PM. Do you have your crank yet? there was only .002 of thrust clearance, so he is going to add .003 to the thrust as well as grinding another .001 on the mains and .0015 on the rods. I took it back yesterday and he thought he could have it done by this coming weekend. Dave is really great to work with. Before returning the crank yesterday, we did mock up one rod and piston to check for piston to valve clearance with the new cam that is 235/243 .640/.640 on a 112 lobe sep.
Once the crank is corrected, the rotating assembly is off to get balanced, the block gets jet washed, and the rear-grooved durabond cam bearings installed, and then assembly starts! It would be a good idea to ask Dave exactly what the stroke is-then ck it yourself. I didn't get the crank this week, Dave had a rough week and was behind. He expects it to be done early next week. Did you get the crank? Picked up the crank this afternoon. Going out of town first thing tomorrow, but I am going to try and check clearances in the next few days when I get back in town. The main bearing clearances are looking too-big at this point, as I don't think Dave was able to skim it lightly enough this last time, which I understand. I am going to retorque it to 100% torque with ARP lube tomorrow and re-check the clearances. It is really tough for even the best crank grinders to sneak up on clearances .001 at a time. We may have to go .020 on the crank now to get it fixed, and just sell the coated .010 bearings we have now. I am thinking we may have to get some new main caps and have it align-bored to get it right, so now we are looking at those options. I am thinking this block may have gotten a center main cap from another engine, which would have explained why it was align-honed originally. Can anyone offer some options that they have used on the main caps/girdle setup? I really don't want to get into the oil pan modification route for a pan-rail girdle. I see the M&J Proformance and Pro-Gram engineering main caps and they look very good. This would also give us more confidence if we decide to bump it up with some boost or nitrous to get it over 700hp+. Last edited by Battenrunner; September 9th, 2018 at 09:40 PM. You are getting to the point were I would consider a very light piston, and junking your block. Lighter piston less stress on the block, free hp with a modern ring pack its a win win. If the crank is not special just start over and find a good core. Last edited by Bernhard; September 10th, 2018 at 06:54 AM. 1. 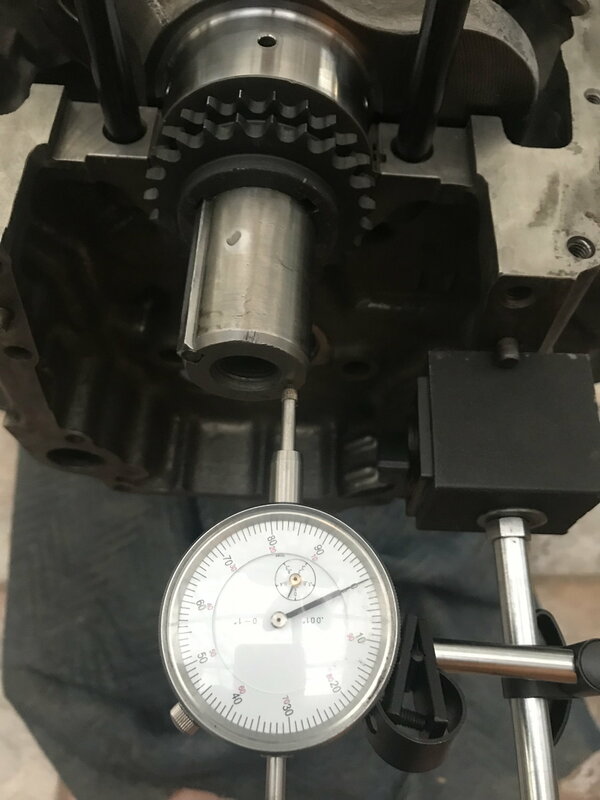 The main housing bore is set to a desired spec, the middle of the spec is preferred by my self, this is measured by Sunnen dial bore gauges with a Sunnen setting fixture. 2. The mains are then torqued to spec with the bearings installed with the desired lube on the fasteners, the bearings are then measured with a Sunnen dial bore gauge, these sizes are then recorded and the crank is then ground off these sizes to the desired journal sizes by a competent crank grinder. Any other way is a waste of time. If you need help with this procedure I'd be happy to help. BTW when the stroke is checked on that crank you will then find out just how much Dave cares about your project. Last edited by VORTECPRO; September 10th, 2018 at 07:42 PM. Thank You Vortecpro, I sent you a PM. I believe we have had several problems on this build because we were changing too much without taking an accurate baseline measurement ourselves. We relied on the old buildsheet specs from the blueprint too much and I knew better, I just didn’t have the money or the right tools to check it properly myself. I was relying on measurements done by others, which was my fault. 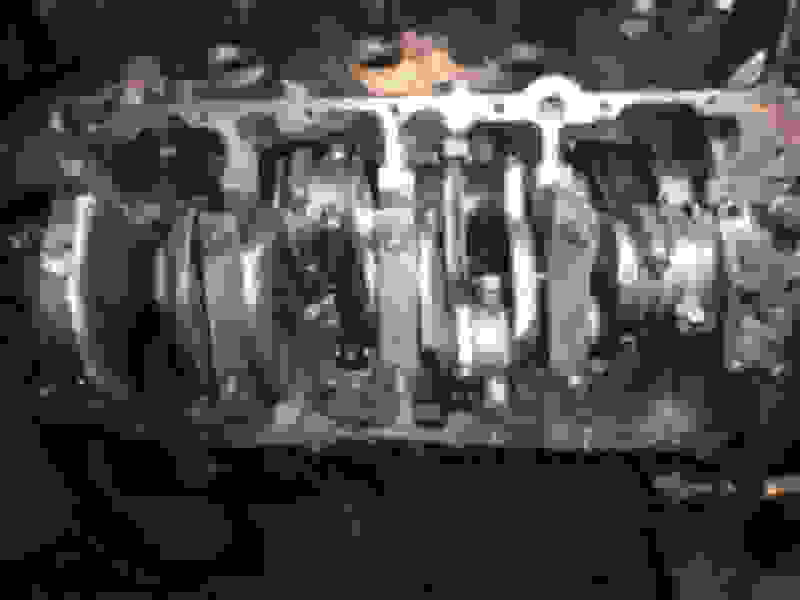 The crank was previously ground before the engine was originally assembled. The Blueprint specs on the build sheet showed the clearances to be way too tight versus what I felt comfortable with. Then we had the bearings Polydyne coated and we have been chasing our tails trying to get the clearance ground into the crank correctly now. I had an internal dial bore gauge and good 2-3 inch micrometer before when I used to mess with engines with my friends, but since we moved 5 years ago, I got rid of almost all my tools back then. You are spot on with your technique to establish a baseline and how to measure what clearances you want when you have the right tools in hand. 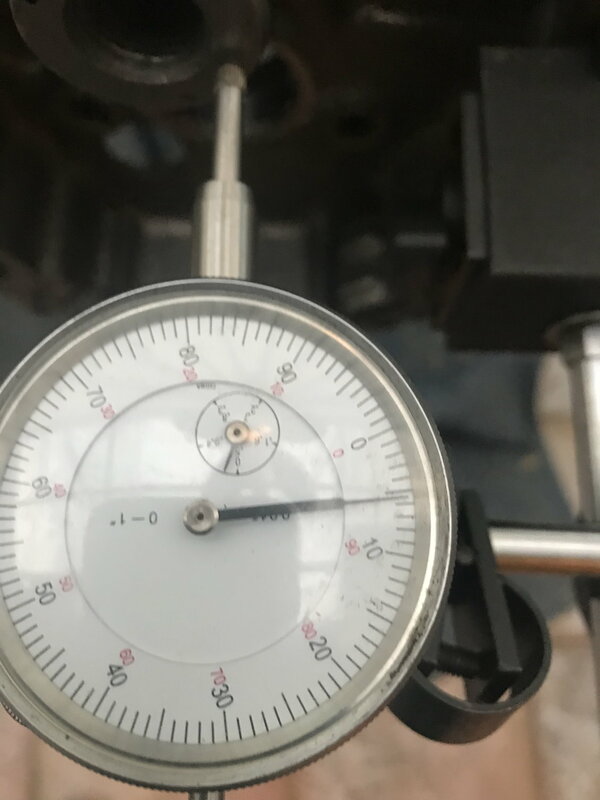 We have recently (last week)acquired a good Starrett Micrometer that can be adjusted from 1 inch to 4 inches with standards, and we now also have a good dial bore gauge accurate to .0005. As for the main thrust clearance, my Dad was working with the block today and he thinks he is able to wedge against the #3 cap and get the thrust alignment correct if he puts pressure on it while torquing it down..... so we will see about it. Last edited by Battenrunner; September 10th, 2018 at 08:07 PM. We were able to mock up the bearings again with 100% torque with Moly lube, and unfortunately, nothing really changed. With the main bearings being so loose, and the rod side clearances so loose on the 5-6 and 7-8 journals in combination with the rod bearings being on the high side means that we are going to have to start over at .020/.020. We were able to massage the #3 main cap just a few thousandths where the studs come through to allow the thrust bearing on the cap to square up with the main bearing in the block without being pressured or "loaded" while torquing, so I don't think we will go with the aftermarket main caps unless we find some issues with the alignment and main bore dimensions, which Mark (Vortecpro) is going to measure with us so we know if everything is spot on or needs to be machined/remedied. We are going to start over and get the crank ground by Mark (Vortecpro) in Colorado Springs. We will have some nice .010/.010 Polydyne coated Clevite/Michigan bearings up for sale in the classifieds section. Last edited by Battenrunner; September 11th, 2018 at 09:16 PM. I can't thank Mark (VORTECPRO) enough for his kindness in taking time to look at all of our engine parts with the close inspection that was needed, as I knew I wasn't happy with the crank polish/finish and the clearances that I had found in our initial inspection. I know he is doing us a favor, because his shop was extremely busy, with bustling movements of guys working all around, and there were a bunch of engines and parts in all stages of machining, with a crank in the balancing machine, valves being ground and then final lapped into their seats, and another block in process in the boring machine with a torque plate mounted on it. I knew I was in the right place when he had all of these precision machines in a separate air-conditioned room which was kept cool and very clean. Mark and his crank specialist were able to mount the crank on V-blocks on an inspection table and inspect the crank with a close eye and a good light. They found burnished (rough) surfaces on two of the crank throws that were undercut below the rest of the journal and not polished, every main journal was ground to a largely different number, several over .0015 different compared to others, and the rear main journal was tight by .001 instead of being looser than the other journals. They also found that the crank snout was bent by .004, and were able to straighten it out to virtually zero run out. I know .004 doesn't sound like a lot, but when you spin it at 5,000 rpm, I promise you it will add undue stress and vibration that the damper may not be able to cancel out, as well as wearing out the crank seal prematurely and also wearing the elastomer rings out quicker in the ATI ring. I just picked up the bearings so I will be taking them down and torquing them in person into the block for Mark to take measurements to grind the crank to the targeted dimensions. Last edited by Battenrunner; September 14th, 2018 at 10:03 PM. Just a quick update, Mark (VORTECPRO) has been going over things with a fine tooth comb. 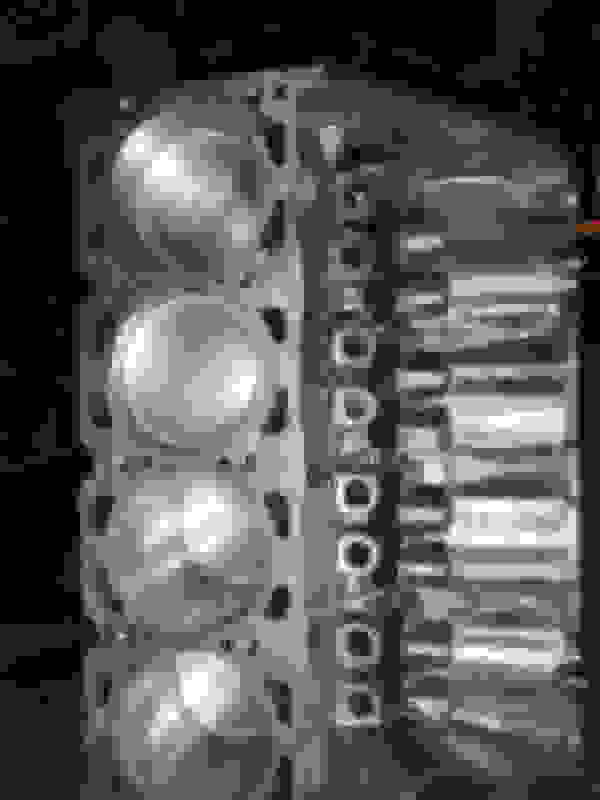 I had noticed that none of the pistons had any balancing holes on them as they came out of the "balanced" rotating assembly, so Mark weighed them while I was standing there, and he found as much as 4 grams of difference between only 3 pistons that he weighed..... needless to say, they were never balanced in the original build. This just added one more thing to correct when he balances the rotating assembly, but I am not worried, as I know that these parts are in great hands with Mark. Mark is also going to mill the block for the front cam thrust washer so we don't have to worry about it. I picked up all the parts from Mark (Vortecpro) in Colorado Springs this last Wednesday. There was a ton of extra work done by Mark and his crank specialist Jeff to repair all of the wrongs that had been performed to all of the journals, rods and mains, as well as all of the extra balance holes that had been drilled into the front and rear counterweights that Mark had to weld up and re-contour to get the crank to balance correctly. Again, I can't thank Mark enough for going the extra mile on helping me out with our build. The level of perfection that he and his team strive for are impressive to say the least, and unprecedented among machine shops these days. We plan to have the completed engine Dyno'd by Mark at his in-house dyno, which he showed me. The crank was very bad as I received it originally from Mile High Crankshaft, as proven by the videos below. Today, My Dad and I deep cleaned the block and crank, and we are having the block jet-washed and getting the new cam bearings installed by Dave at SCH. For the crank, I used a few cans of brake parts cleaner to wash the grease out of the crank oiling passages, as well as using a .17 caliber bore snake to run through the passages several times before and after being sprayed until it was all super clean in and out. I then put it in a trash bag and sprayed some penetrating oil on it to keep it from rusting(I will remove this preservative oil with more brake parts cleaner when it is ready to go together. The block is supposed to be ready by next weekend, if not before. I cleaned the rods up and installed all the rod bearings to the matching numbered rods and now I have them ready to install the pistons tomorrow. Last edited by Battenrunner; November 3rd, 2018 at 09:06 PM. Last edited by Battenrunner; November 3rd, 2018 at 09:01 PM. Did you show those videos to Dave Sarno? Its also important to note the big ends of your rods (Eagle) although new were out of spec as well, which is very common. Last edited by VORTECPRO; November 4th, 2018 at 08:55 AM. I couldn’t show Dave Sarno, because I didn’t have them on my phone and they were not working correctly until I was able to upload them to YouTube last night. I did explain what happened and he was dissapointed but didn’t seem surprised. He said he has been buying new billet cranks or higher quality units new. The last several cranks he had done by Mile High took way too long and caused stress on Dave Sarno because of upset customers. He told me that he hasn’t used Mile High In quite a while. Yes, I forgot to mention that all of the eagle rods were larger than the maximum size spec and would have been way too loose on bearing crush. Mark had to resize the big ends and hone the wrist pin bushings to fit the pins as well. It goes to show that until you step into the $1,000 rod prices, you probably can’t just run them out of the box, and even they should be checked of course. Last edited by Battenrunner; November 4th, 2018 at 09:14 AM. We picked up the cleaned block with the new cam bearings installed this afternoon! We are preparing the sun room to be our clean room for assembly. It is all tile floor and windows, and nothing to kick up dust, as well as no carpet to stain with any oily drips as we plan to put cardboard down under the engine stand. I hope to start assembling pistons onto rods with a set of 4 spiro-lox per piston by Thursday afternoon to get ready for the assembly of the shortblock. We got all the pistons hung on the rods and moved the block into the sunroom that we are using as our clean room for the assembly. We cleaned and inspected the main bearings and trimmed the rear 2 piece main seal and put a few dots of silicone on the rear section of the #5 main cap. Torqued all mains at 105ft-lbs with moly. The crank has .0055 thrust clearance with cap centered and torqued. using Lucas engine assembly lube and Joe Gibbs BR 15-50 oil for assembly. Well, two steps forward and one step back...but now we are back on track. Sure enough, we were installing pistons and rods last weekend, #8 in, turns over no problem, #7 in, turns over and locks up the rotation with the rod hitting the inside upper part of the cylinder edge. So, we dissasembled everything again, leaving only the cam bearings in the block, and we cleaned with starting fluid (leaves no residue) and taped all surfaces except where we were grinding. No grease or oil anywhere. Did the grinding with a Harbor freight 90 degree air die grinder and used a hard stone that worked like a charm. We measured down the water jackets first and found them extra thick in these areas, so believe me, there was no way we would hit water barely touching these up by 1/4 inch or less. Dad vacuumed out all the grit and I washed it down with starting fluid as we slowly peeled back the tape and everything came out great, not a single bit of grit or dust on a clean super fine white micro-fiber towel to check it with. So we checked our work and all had clearance now. Installed all eight pistons. Turns over great with minimal drag. I will check it with a torque gauge tomorrow if I can, in case others want to know like I do. Double checked the thrust and got .0055 again on the money. Last edited by Battenrunner; November 16th, 2018 at 10:57 PM. Yeah even with that lift, I’ll bet you had a mile of valve to piston clearance. And yes, you normally only need to clearance the block a little, and you’d need to grind a lot before you’ll hit water.